This latest MathStart title, this one aimed at teaching place value and recycling. In the story, an elementary school's 'Save the Planet Club' wants to earn money to buy flowers for the local park, so the students decide to gather aluminum cans that they can turn in for coins. If they gather 5,000 cans, they will have enough to money to buy the flowers, but keeping track of the daily totals proves very difficult. Finally, when start sorting the cans in bags of 10, 100, and so on, the task becomes much easier. 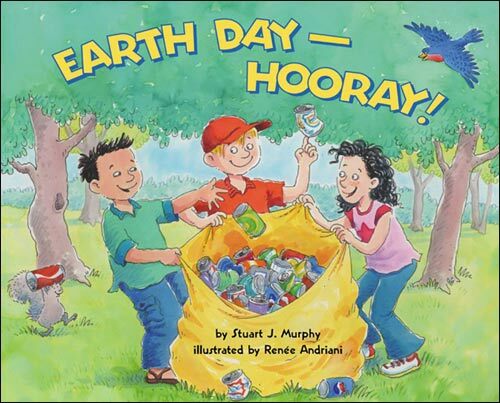 This is a good book for teaching place value (math), recycling and the environment, and of course Earth Day! Renee Andriani's illustrations are both adorable and informative, adding clarity to the text and the math concepts covered. In their review, Booklist suggests this title for "jazzing up a routine math lesson or...Earth Day activities." We agree! Below are the first three spreads from inside this book. Remember, this book isn't only about math; it's also about recycling and caring for the environment. The children in this book provide great examples for children, demonstrating how a small group of people--even kids--can make a difference for the planet and in their local neighborhood. As you read the story with your child or students, point out how the cans are bundled together in groups of 10s, 100s, and 1,000s. Discuss how 10 ones equal 10, 10 tens equal 100, and 10 hundreds equal 1,000. Write down a three-digit number and have your child or students draw bundles of cans to represent the number. Discuss with your child or students items that he or she can recycle, such as newspapers or cans. Set a goal for the number of items to recycle, perhaps 100 newspapers or 1,000 cans. Have your child or students keep track of the number collected and how many items he or she still needs to meet the goal.